An Airbus A320-233 operated by TAM Linhas Aéreas of Brazil was destroyed when it suffered a runway excursion after landing at São Paulo-Congonhas Airport, Brazil. TAM Flight 3054 was a regular passenger flight from Porto Alegre to São Paulo-Congonhas. The aircraft departed Porto Alegre at 17:19 with 181 passengers and 6 crew members on board. The aircraft was operating with the number 2 engine reverser de-activated, in accordance with the Minimum Equipment List (MEL). The weather prevailing along the route and at the destination was adverse, and the crew had to make a few deviations. Up to the moment of the landing, the flight occurred within the expected routine. According to information provided to the Tower controller by crews that had landed earlier, the active runway at Congonhas (35L) was wet and slippery. Runway 35L is a 6365 x 147 feet (1940 x 45 meters) asphalt runway with a Landing Distance Available of 1880 m.
In the beginning of 2007, the runways at Congonhas were subjected to a restoration to correct surface irregularities and correct problems of gradient, so as to prevent water accumulation. With the new pavement, the coefficient of friction of the runway surface was improved. However, since more time was be needed until the tarmac could be ready to receive the grooving, the airport administration decided to put the main runway in operation even without the grooves on 29 June 2007. The flight touched down at 18:54 local time at a speed of 142 knots. Airbus had introduced a simplified procedure for landing with a deactivated thrust reverser in which crews had to select reversers for both engines after landing. Computer logic would which reverser was inoperative and thus block the increase in power. This simplified procedure however added an additional 55 meters in the calculations of the runway length required for landing if the runway was contaminated. However, the flight crew failed to use this procedure and left the thrust lever of engine no.2 positioned at "CL". This caused the autothrust to try to maintain the speed previously selected. Another consequence was the nondeflection of the ground spoilers, since, in accordance with their logic of operation, it is necessary that both thrust levers be at the "IDLE" position, or one of them be at "IDLE" and the other at "REV" (reverse), for the ground spoilers to be deflected. The non-deflection of the ground spoilers significantly degraded the aircraft braking capability, increasing the distance necessary for a full stop of the airplane by about 50%. Additionally the autobrake function, although armed, was not activated, because the opening of the ground spoilers is a prerequisite for such activation. When the nose gear touched the runway, about 2.5 seconds after the left main gear, the number 1 engine thrust lever was moved to the "REV" position. With this action, the autothrust function of the aircraft was disconnected and the thrust lock function was activated, with the purpose of preventing the acceleration to reach the climb power level. As a result, this function froze the number 2 engine power in the value it was at that moment (EPR2 = 1.18). The thrust lock function is disabled by the movement of the thrust lever, but since this movement did not occur, the number 2 engine remained with that power until the collision. About six seconds after the main gear touched the runway, there was the first activation of the brakes by means of the pedals, which reached the maximum deflection five seconds later. The FDR also recorded the use of the rudder and the differential braking by the pedals as the aircraft veered to the left. Since the runway is at a higher elevation than the surrounding street and residential area, the A320 crossed over the Washington Luís Avenue, and collided with a concrete TAM Express building and a fuel service station at a ground speed of 96 knots. All the persons onboard suffered fatal injuries. The accident also caused 12 fatalities on the ground among the people that were in the TAM Express building. The accident caused severe damage to the convenience shop area of the service station and to some vehicles that were parked there. The TAM Express building sustained structural damages that determined its demolition. At a certain moment, during the approach, the PIC reported having a mild headache. Although it was not possible to verify which type of headache it was, or even to evaluate its intensity, it is possible that this trouble may have influenced his cognitive and psychomotor capabilities during the final moments of the flight, when the unpredictability of the situation demanded a higher effectiveness of performance. This factor was considered undetermined due to the impossibility of confirming its contribution in factual terms. The theoretical qualification of their pilots was founded on the exclusive use of computer interactive courses (CBT), which allowed a massive training, but did not ensure the quality of the training received. In addition, the formation of the SIC was restricted to the “Right Seat Certification”, something that proved insufficient for him to deal with the critical situation experienced after the landing. Lastly, there was a perception among the crews interviewed that the training through the years and on account of the high demand resulting from the company’s growth was being abbreviated. One of the hypotheses considered in this investigation was that the pilot may have attempted to perform a procedure no longer in force at the time of the accident for the landing with a pinned reverser. This procedure consisted in the receding of both levers to the “IDLE” position during the flare at about a 10-foot altitude, and, after touching down, in activating the only reverser available, maintaining the thrust lever of the other engine in the “IDLE” position. This procedure, though being more efficient from a braking perspective, could induce the crew to making mistakes, as there were several reports of occurrences in which there was a wrong setting of the levers, motivating the manufacturer to establish a new procedure, months before the accident. Thus, there is a high probability that the PIC inadvertently left one of the thrust levers in the “CL” position, placing the other one first in “IDLE” and later in the “REV” position. This factor was considered undetermined due to the impossibility of confirming its contribution in factual terms. Independently of the hypothesis considered, the monitoring of the flight at the landing was not appropriate, since the crew did not have perception of what was happening in the moments that preceded the impact. This loss of situational awareness hindered the adoption of an efficient and timely corrective action. It is possible that the pilot has inadvertently left one of the levers at the “CL” position, while trying to perform a procedure no longer in force for the operation with a pinned reverser. The procedure prescribed for the operation with a pinned reverser had been modified by the manufacturer and, according to the FDR recordings, the procedure in force was known to the crew and executed by them on the leg that preceded the accident. However, as this procedure imposed an increase of up to 55 meters in the calculations of runway distance required for landing, it is possible that the PIC deliberately tried to perform adoption of a procedure no longer in force would characterize flight indiscipline. The operating conditions of the Congonhas runway, may have affected the crew’s performance from a psychological perspective, considering the state of anxiety that was present in the cockpit. In addition, the lack of luminosity resulting from the operation at night time, associated with the size and color of the thrust levers may have hindered the verification of a contingent inappropriate positioning of those controls during the landing. This factor was considered undetermined due to the impossibility of confirming, in factual terms, the psychological influence of the runway operating conditions and/or lack of luminosity on the performance of the crew. In view of all the operation scenario – the 55 meters added on account of the reverser procedure, the 2.4 extra tons of fuel on account of the tankering, the crowded aircraft, the pressure to proceed to Congonhas, the PIC’s physiological condition (headache), a SIC with little experience in the A-320 and in its autothrust system, the wet and slippery runway, the occurrences of the preceding days – there is a high probability that the PIC deliberately tried to perform the procedure no longer in force for the operation with a pinned reverser, in order to increase the braking efficiency, inadvertently leaving the number 2 engine thrust lever in the “CL” position. Considering this hypothesis, the diversion to an alternate airport would be desirable, instead of trying to perform a procedure that was not prescribed. At the time of the accident, the operator had a disproportional number of captains in comparison with the number of co-pilots, a fact that obliged the scheduling sector to form crews with 2 captains. Thus, although complying with the minimum requirements of the regulation in force, such a practice may have contributed to the creation of a climate of complacency in the cockpit of the JJ3054. Besides, the long experience of the SIC as a captain was not a guarantee of his competence in the co-pilot function – for which he had done only the “Right Seat Certification” training – and, added to his little experience in that aircraft, it contributed to the loss of situational awareness in the most critical moments of the flight. Thus, considering the hypothesis that the PIC deliberately tried to perform the old procedure for a landing with a pinned reverser to increase the braking efficiency, it is possible that the use of that procedure was not appropriately prepared, something that could have favored the wrong positioning of the levers (according to the hypothesis mentioned above, it is possible that the PIC inadvertently left the nº2 engine thrust lever in the “CL” position.). The lack of a briefing for the descent in the CVR recording hindered the confirmation of a possible intention of applying the old procedure, no longer in force at the time. Despite his long experience in commercial jets, the SIC possessed only about 200 flight hours in aircraft of the A-320 type. Besides, his experience in the function of co-pilot was restricted to the “Right Seat Certification” training, which proved insufficient to deal with the emergency situation. The operator allowed the crew to be composed of two captains, with the occupant of the right-hand seat having done only the “Right Seat Certification” training. Besides, the lack of coordination between the several sectors of the company, especially between the sectors of operation and training, determined the lack of an appropriate monitoring of the processes and of the quality of the pilots’ professional formation. The CVR recording allows to perceive that the PIC was showing anxiety in relation to the runway conditions for landing, and on two different occasions he asked the SIC to request from the TWR-SP the rain and runway conditions, and on one of them specifically, whether the runway was slippery. It is possible that the state of anxiety present in the PIC may have influenced the performance of the crew to some extent. This factor was considered undetermined due to the impossibility to confirm that this anxiety has effectively influenced the performance of the crew. Although perceiving that the ground spoilers had not deflected, the pilots were not able to associate the non-deflection with the positioning of the thrust levers. In addition, there is a high probability that the pilots were led to believe that the lack of the expected deceleration after landing was a result of the conditions of operation with a wet runway, the influence of which, from a psychological aspect perspective in the field of individual variables, was perceived along the investigation. The stress has effect on the cognitive level (diminution of the concentration, diminution of the response speed, degradation of the memory, etc. ), emotional level (alteration of the characteristics of personality, weakening of the emotional control, lowering of the self-esteem, etc. ), behavioral level (alterations of the sleep pattern, diminution of interests, verbal articulation problems, etc. ), and physiological level (sudoresis, tachycardia, sleep pattern alterations, gastric and dermatologic symptoms, etc.). The presence of stress triggering stimuli was perceived, such as the state of anxiety on the part of the pilots, especially regarding the runway conditions, the cephalalgia of the PIC, the issues concerning the operation in Congonhas with a wet runway, the crowded aircraft and the inoperative reverser. However, it was not possible to determine whether those stimuli effectively led any of the two pilots to a high level of stress. This factor was considered undetermined due to the impossibility to confirm its contribution in factual terms. On the other hand, if one considers the hypothesis that the nº 2 engine thrust lever was inadvertently left in the “CL” position, while the pilots were trying to perform a procedure no longer in force, the characteristics of the autothrust system, which keep the levers motionless during the variations of thrust, in addition to the size and color of those control levers, hard to be observed on a night flight, were not sufficiently evident to be perceived by the pilots. This situation was aggravated by the lack of a warning device relative to the conflicting positioning of the thrust levers. Thus, no matter which hypothesis is considered, the loss of the situational awareness emerged as a result of the very lack of perception on the part of the pilots. In this sense, the automation of the aircraft, however complex, was not capable of providing the pilots with sufficiently clear and accurate stimuli, to the point of favoring their understanding of what was happening in the moments just after the landing in Congonhas. In relation to the crews of the company, the investigation identified the perception that there was a pressure on the part of the management against diversions, on account of the inconvenience they could arise for the passengers and for the company itself. If the pilots of the JJ3054 shared that perception, it is possible that this factor could have some influence on the pilot’s decision to proceed for the landing in Congonhas, in spite of his concern with the runway operating conditions. The regulatory organization, although having already considered the availability of the reversers as a requirement for the operation in Congonhas, at least since April 2006, such a requirement was only formalized as a norm in May 2008. The opportune regulation of this requisite would have prevented the aircraft from operating in Congonhas with a wet runway condition. In relation to the training, the investigation identified in the crews a perception that the company seemed to have reduced the contact hours applied to it, although in formal terms those contact hours had remained unaltered. In relation to crew professional formation, the investigation identified a tendency on the part of the company to reduce the number of hours assigned to training, which remained unaltered in formal terms. Moreover, the FDR recordings showed that, during the period in which the aircraft operated with the pinned reverser, 5 different types of landing procedures were performed by the various crews who operated it. This factor was considered undetermined due to the impossibility to confirm, in factual terms, that the crews’ perception of a shortening in the training processes being applied was consistent with reality and/or whether such alleged shortening effectively influenced the performance of the crew, contributing to the accident. It was verified that, for an A-320 airplane proceeding to land, it is possible to place one of the thrust levers at the “REV” position and the other at “CL”, and no alerting device will advise the pilots in an efficient way. This situation may put the aircraft in a critical condition and, depending on the time it takes the crew to identify this configuration, and on the runway parameters, a catastrophic situation may occur. In the specific case of this accident, even with the aircraft on the ground (Weight on Wheels - WOW), with the number 1 engine thrust lever at the “REV” position, with the ground spoilers armed, with the autobrake selected, and with application of maximum braking pressure on the pedals, the power control system gave priority to the information that one of the levers was at “CL”, and this lever did not have any safety devices regarding a possible inadvertent setting. To immediately restrict the operation on the 17R/35L runway (main runway) of Congonhas Airport (SBSP) to the condition of "dry runway". To consider the 17R/35L (main) and the 17L/35R (auxiliary) runways of the Congonhas Airport (SBSP) as PRACTICABLE, only when their surface characteristics meet the skidresistance requirements prescribed in the Civil Aviation Instruction – IAC 4302, dated 28 MAY 2001, taking into account the Safety Recommendation - RSV (A) 45/A/07 – CENIPA, issued on 20070721. To evaluate the condition of PRACTICABILITY of the 17R/35L (main) and 17L/35R (auxiliary) runways of the Congonhas Airport (SBSP), based on the results of the friction and surface texture measurement tests of their pavements, executed and forwarded by the Airport Administration after the construction, re-covering, maintenance or periodic inspection of the runways, in accordance with the IAC 4302, dated 28 MAY 2001. To maintain an effective control of the execution by the Airport Administration of the friction and surface texture measurement tests concerning the pavements of the 17R/35L (main) and 17L/35R (auxiliary) runways of the Congonhas Airport (SBSP) after the construction, recovering, maintenance or periodic inspection of the runways, in accordance with the IAC 4302, dated 28 MAY 2001. To establish parameters and procedures so as to guarantee the safety of air operations on the 17L/35R (auxiliary) runway of Congonhas Airport (SBSP), in case of rain. To make provisions for the evaluation of the performance of large size jet aircraft (more than 60,000 pounds), which operate or are expected to operate at the Congonhas Airport (SBSP) runway system, based on demonstrations of real operations with special landing techniques on wet runways, according to the method prescribed in the IAC 3502-121 0888, establishing the operational flight parameters and procedures, as well as the infrastructure, to guarantee the safety of the landing and take-off operations at the airport. To inform the various companies operating at Congonhas (SBSP) that, for purposes of planning the air operations on the 17R/35L (main) and 17L/35R (auxiliary) runways, their respective Operation Managements, based on information published by the INFRAERO, by means of NOTAM, concerning the friction and surface texture requisites, in accordance with the IAC 4302, dated 28 MAY 2001, must do the runway analysis for their different types of equipment, in order to adjust to the existing conditions of the runways afore mentioned. To follow the actions concerning the monitoring of the evolution of the friction and surface macro-texture parameters of the Congonhas Airport main runway (SBSP), to be executed by the airport administration, so as to have technical data and information elements capable of facilitating and expediting the evaluation of the special maintenance plan to be proposed by the airport administration. To determine the establishment of the Runway End Safety Area (RESA), in accordance with the technical standards set by the ICAO Annex 14, as one of the infrastructure priority parameters to be established for the Congonhas Airport (SBSP), adjusting the other components of the runway system to the operational safety requisites of the runways, thus guaranteeing the safety of the landing and takeoff operations as recommended in the RSV(A) 50, even though it may imply the shortening of the current length of the main and auxiliary runways. To monitor the surface characteristics of the 17R/35L (main) and 17L/35R (auxiliary) runways of Congonhas Airport (SBSP), in accordance with the IAC 4302, dated 28 MAY 2001, readily implementing the appropriate corrective actions for the recuperation of the required safety standards, whenever the levels of maintenance of the friction or surface texture coefficient are below the prescribed minimums, immediately informing the airmen, by means of NOTAM, on the conditions of the runways aforementioned. To forward to the National Civil Aviation Agency (ANAC) the results of the measurement of friction and surface texture tests relative to the pavements of the 17R/35L (main) and 17L/35R (auxiliary) runways of Congonhas Airport (SBSP) after any construction, recovering, maintenance or periodic inspection, as established by the IAC 4302, dated 28 MAY 2001. To take measurements of the friction coefficient and surface macrotexture of the 17R/35L (main) runway of Congonhas Airport (SBSP), considering the cutting of grooving, and forward the results to the National Civil Aviation Agency, as prescribed in the IAC 4302, dated 28 May 2001. To take measurements of the friction coefficient and surface macrotexture of the 17R/35L (main) runway of Congonhas Airport (SBSP), every fortnight at the least, so as to evaluate the evolution of those parameters, as a result of the rubber build-up caused by the landing and takeoff operations on the 17R/35L (main) runway. To submit, for the approval by the National Civil Aviation Agency, a special plan of maintenance of the 17R/35L (main) runway of Congonhas Airport (SBSP), based on results obtained through the procedure determined in the Safety Recommendation - RSV (A) 57/A/07 – CENIPA. To adjust the performance of their aircraft for the operations at the Congonhas Airport (SBSP), considering the possibility of using the 17L/35R (auxiliary) runway for landings and takeoffs in rainy weather. To emphasize the strict adherence of the technical crews to the MEL of the A319, A320 and A321 equipment, relative to the item 78-30 – OPERATIONAL PROCEDURES – EXHAUST – THRUST REVERSER, which deals with the operation of the aircraft with a pinned thrust reverser. To publish to the Brazilian aeronautical community, by means of the DIVOP (Operational Publication) and other existing means of communication, the content of these Safety Recommendations (RSV), in order to maintain a high level of perception and situational awareness. To carry out a Special Flight-Safety Inspection in the TAM LINHAS AÉREAS S/A company, in accordance with the NSCA 3-3, item 6.2.2. To carry out a Special Flight-Safety Inspection in the INFRAERO AAL-SBSP, in accordance with the NSCA 3-3, item 6.2.2. To study the convenience of adjusting the operation of their aircraft at airports defined by them as "airports operation under special condition", while considering the possibility of not making landings and takeoffs in situations with pinned thrust reversers. To set procedures for the RBHA 121 operators to insert in the briefing of descent an analysis of the runway length necessary for landing and the actions to be taken in case of nonfunctioning of the ground spoilers and/or brakes. Such analysis has the objective of defining the immediate start of a pull-up (go-around), if necessary. To study the viability of setting norms for the RBHA 121 operators to insert, in the procedure after the touchdown, the confirmation of the functioning of the ground spoilers before the activation of the thrust reverser. This sequence has the objective of allowing a touch-and-go landing, in case of non-functioning of the ground spoilers. To establish procedures for the RBHA 121 operators to do training in flight simulators of touch-and-go landings after the non-functioning of ground spoilers and/or brakes, with the objective of demonstrating the characteristics of the aircraft performance under those conditions. To update the pertinent documentation so as to officially the procedures recommended in the RSVs 144, 145 and 146. To evaluate the convenience of establishing deactivated thrust-reverser landing training for the RBHA 121 operators, with the objective of implementing the training under such condition. To study the need of establishing parameters for the performing of tankering by the RBHA 121 operators, when proceeding to land in limit conditions of the landing envelope. To make provisions for the repositioning and/or calibration of the level of illumination of the parking ramp reflectors of the Congonhas Airport (SBSP) new passenger terminal, so as to prevent the dazzling of pilots during the landing and takeoff operations at the main runway (17R/35L). To reformulate the procedures utilized in the processing of the Prevention Reports - RELPREV, so as to prioritize their quick reception by the Local Airport Administrations (AAL) and their immediate analysis, deliberation and execution of pertinent preventative actions. To implement procedures which establish the active participation of the AAL in the oversight of the works executed in their respective airports, aiming at guaranteeing full knowledge of the physical modifications made and the compatibility of the operational practices. To establish a procedure for the A-320 aircraft model, regarding the landing phase, defining a corrective action to be taken by the crew when the ground spoilers do not deflect after the touchdown. 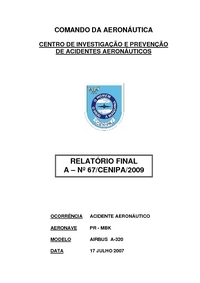 To study, in coordination with the certification organizations of other countries and aircraft manufacturers, the need to establish procedures for the aircraft certified under the Brazilian Aeronautical Homologation Regulation - RBHA 25, regarding the landing phase, defining a corrective action when the ground spoilers do not deflect after the touchdown. To optimize the RETARD auto call-out system of the A-320 aircraft, so that it executes only the function to which it was designed, that is, advise the crew to set the thrust levers in the "IDLE" position. To monitor and evaluate, in coordination with the EASA, in terms of safety requisites and time for its implementation, the proposal of modification of the RETARD auto call-out system of the A-320 aircraft, so that it performs only the function for which it was designed, namely, to advise the crew to place the thrust levers in the "IDLE" position. To issue, in the short term, an Airworthiness Directive so that the Type design of the A-320 aircraft includes a warning system to allow the crew to identify a wrong setting of the thrust levers and take the necessary corrective actions to maintain the safety of the operation. To establish certification criteria under the Brazilian Aeronautical Homologation Regulation - RBHA 25 to require that the aircraft designs already certified and the aircraft designs in process of certification have their power control systems and their warning systems optimized, so as to allow the identification of the conditions in which the thrust levers are incorrectly positioned during critical phases of flight. To enhance the logic of functioning of the systems responsible for the deceleration of the A- 320 aircraft, so that it considers the clear intention of the crew to land and ensures the effectiveness of the deceleration, even if there is an incorrect positioning of the thrust levers. To monitor and evaluate, in coordination with the EASA, in terms of safety requirements and time for its implementation, the proposal for the modification of the logic of actuation of the systems responsible for the deceleration of the A-320 aircraft, so that it considers the clear intention of the crew to make a landing and guarantees the effectiveness of the deceleration, even if the thrust levers are incorrectly positioned. To evaluate the advantages and disadvantages of utilizing the thrust reverser before verifying the deflection of the ground spoilers in the A-320 aircraft, and to establish a more proper procedure from the perspective of Flight Safety. To evaluate, for the aircraft certified under the RBHA 25, the advantages and disadvantages of utilizing the thrust reverser before verifying the deflection of the ground spoilers, and to study the need of establishing the most proper procedure from the perspective of Flight Safety. To ensure the real effectiveness of the theoretical training, considering: the feasibility of the adoption of training systems that utilize the computer as a basic tool for learning (CBT); and the need to establish mechanisms for a better monitoring and evaluation of the teaching method applied during this phase. To re-evaluate the requirements established for the professional formation and knowledge updating of the technical crewmembers of the aviation segment under the RBHA 121, notably in relation to the syllabus and training hours, aiming at adjusting them to the real needs observed before the operators. To carry out an internal audit of all the operation, training and maintenance processes conducted within the company, aiming at the gathering of non-conformities in relation to the regulation in force, as well as measuring the effectiveness of those processes. To re-evaluate the Training Program, aiming at adjusting it to the real needs of the operation, and considering: the need of a better monitoring of the crew technical-operational conditions; the adequacy of the contact hours currently adopted; and the efficacy of the methodology applied to the theoretical training. To refine the processes of performance monitoring of the crews along their operational life in the company, from the very beginning of the training, so as to allow for the timely correction of operational deviations. To establish distinct training processes for the professional formation and updating of the pilots, based on the crew performance monitoring mentioned in the Safety recommendation RSV (A) 14/A/08 – CENIPA. To unify the management of the practical and theoretical training of the crews, with the purpose of obtaining a better control of the quality of the professional formation and knowledge updating. To establish mechanisms to ensure the standardization of the Flight Instructors, in order to improve the trainings, better the adherence to the prescribed operational procedures and provide familiarization and experience to the instructor in the operation on the right-hand seat of the airplane. To create incentive mechanisms to motivate the flight instructors, besides acknowledging the importance of their role. To establish criteria so that the occupation of the right-hand seat of the aircraft cockpit be limited to: co-pilots; instructors; or captains taking up instructor formation courses. To re-structure the CRM training, with the purpose of increasing the perception of the organizational culture influence on the crewmember performance, while making it a permanently favorable element for the safety of operations. To establish systematized processes for the oversight of training, technical-operational and maintenance activities, throughout the various management levels, seeking to obtain a coordinated action from the various sectors of the company for the benefit of the safety in the operations. To re-structure the prevention activities conducted by the Safety sector, considering the possibility of having SIPAER accredited elements in the other sectors of the company, so as to increase the capillarity of the Safety Sector, consequently improving the safety mentality in the company, and increasing the effectiveness of prevention. To create programs for the dissemination of the teachings gathered in the operational safety investigations (from accidents, high risk incidents, prevention reports, etc.) which adopt practices not restricted to the utilization of the electronic mail, favoring the personal involvement of the flight safety sector workers, along with the other employees. To establish systematized processes to allow the company prevention sector (SAFETY) to adequately manage the risks associated with the operational activities, including the impacts resulting from the administrative decisions, in accordance with the precepts disseminated by the ICAO regarding the SMS (Safety Management System). To refine the criteria and practices concerning the announcement of changes in operational procedures, aiming at guaranteeing the updating of all the crews, encouraging their commitment, and allowing for a better interaction between the crews and the operations sector. To re-affirm, before the crewmembers, the policy of the company relative to the adoption of the go-around maneuver as a preventative tool, so as to make it clearer and explicit, thus preventing possible deviations which compromise the operational safety. To evaluate the need to restructure the sequence of the texts contained in the manuals of the A-320 aircraft, so as to facilitate and expedite their handling, mainly during the flight. To refine the monitoring mechanisms, favoring a better proactivity in the identification of the hazards and in the management of the risks associated to aspects intervenient in the operation of the companies ruled by the RBHA 121. To study the need to establish a contingency plan for the monitoring of the technicaloperational and maintenance routine of the TAM Linhas Aéreas S/A, so as to ensure that the practices adopted by the company guarantee the operation with safety and meet all the requisites established in the legislation in force. To refine the inspecting mechanisms, so as to ensure that the operators effectively inform the cases of recurrent failures and of failures, malfunctioning and defects, in accordance with the RBHA 21. To revise the acceptance process of the TAM AIRLINES’ General Maintenance Manual, considering the impact that the grouping of failures monitored by the quality system for correction during the execution of more comprehensive checks may have on flight safety. To refine the inspecting mechanisms, so that the operators keep the traceability of the events by means of proper recording and backup mechanisms. To implement inspecting actions regarding the start and/or completion of the processes of certification of all the airports whose certification is mandatory in accordance with the regulations in force. To evaluate the creation of runway end safety areas (RESA) as prescribed in the RBAC 154/2009 at aerodromes included in the criteria established by the RBAC 139, informing the ICAO about the contingent differences found in Brazil relative to the Standards and Recommended Practices of the Annex 14 to the Convention on International Civil Aviation. To revise the dispositions of the IAC 2328-0790, in order to include in the pertinent regulation a requirement for the obtainment of previous approval from the ANAC regarding any project that results in alteration of the runway pavement (no matter what the designation of the object is: renovation, recapping, recovering, etc.) which may cause alteration in the coefficients of friction, macrotexture, or any other characteristic capable of affecting the performance of the aircraft during landing and takeoff operations. To revise the regulation in force, in coordination with the Airspace Control Department, observing the standards and recommended practices issued by the International Civil Aviation Organization, in order to establish procedures, assignments and responsibilities relative to the suspension and restablishment of landing and takeoff operations at airports on account of temporary impracticability or changing of the physical and/or operational characteristics of the runways. To refine the regulation processes to allow the immediate adoption of preventative measures regarding well known situations, so that the slowness of such processes does not diminish the efficiency of prevention. To adopt appropriate provisions in order to allow the start of the certification processes of airports under its administration that are not still certified and whose certification is mandatory in accordance with the regulations in force. To intensify, in the Complete Aeronautical Emergency Exercises (EXEAC), the need of coordination between the public security/ civil defense agencies and the COMAER organizations, in order to ensure that the SIPAER investigators can work in the accident site the earliest possible, without compromising safety. To refine the educational activities prescribed in the Enterprise’s Aeronautical Accidents Prevention Program, so as to guarantee the understanding by the personnel of the purpose and ways of utilization of each one of the SIPAER voluntary reporting tools, stressing the responsibilities of the Enterprise’s SIPAER-Link relatively to the treatment of the information received. To refine the supervision processes relative to the execution of works in the movement area of the airports under its administration, or in other areas that may impact on the airport operations, so as to ensure the compliance with all the requirements of the respective approved project. To submit to the previous approval by the ANAC any project which may implies alteration or renovation of the landing and takeoff runway pavement (independently of the denomination of its object, such as: renovation, recapping, recovery, etc.) and that may cause alteration in the coefficients of friction, macrotexture, or any other characteristic capable of affecting the performance of the aircraft in landing and takeoff operations. To revise the control processes of the maintenance records with the objective of ensuring the necessary traceability of the events. To revise the control processes of the maintenance records with the objective of ensuring the adequate management of the risk associated with the combinations of grouped failures to be monitored by the quality system, in the cases mentioned in the item 4.3.1 do MGM. To revise the procedures and controls established for the records entered in the RTA (Aircraft Technical Records) sheets, with the objective of preventing misinterpretation and/or misunderstanding resulting from unreadability, erasures, lack of standardization in the language used, and lack of data. To establish mechanisms to ensure the effective communication of failures, malfunctioning and defects to the ANAC, as prescribed in the RBHA 121. To refine the voluntary reporting tool through the company’s corporate computer net, so that the identification of the report writer be no longer obligatory, thus preventing the inhibition of the participation of the employees in the processes of accident prevention. To refine the educational activities prescribed in the company’s Aeronautical Accidents Prevention Program, so as to guarantee the understanding by the personnel of the purpose and ways of utilization of each one of the SIPAER voluntary reporting tools, stressing the responsibilities of the Enterprise’s SIPAER-Link relatively to the treatment of the information received. To reiterate, before the pilots, the importance of the compliance with the prescribed phraseology for the communications with air traffic control units, mainly in what refers to the provision of accurate information on the number of persons on board, endurance and alternate aerodrome. To reiterate the importance of the utilization of flight data monitoring for the detection and treatment of deviation from the standards, ensuring the implementation of the necessary preventative actions (such as, additional training, revision of procedures, etc. ), as well as the provision of appropriate feedback to the crews. To study the convenience of issuing a specific guidance as for the comprehensiveness of the applicability of the ICAO Annex 8 standards and recommended practices referring to Human Factors in the context of design certification and continuing airworthiness. The embankment were the aircraft went off the runway. Distance from Porto Alegre-Salgado Filho International Airport, RS to São Paulo-Congonhas Airport, SP as the crow flies is 835 km (522 miles).